SMAP announced their disbandment on midnight of 13th August 2016. On 10th August 2016, Kimura was in Hawaii for an annual family vacation when the rest went to Johnny Kitagawa to apply for disbandment. Nakai was more neutral and wanted the group to stay together, but Shingo/Tsuyoshi/Goro were convinced they should disband. They did not wish to go on hiatus and give fans a false hope of returning. The group will disband at the end of this year, thereafter each will continue with solo work. At this point in time, there are no plans for a disbandment concert or press conference. However, according to an emergency survey by Sports Hochi, 83% of respondents(769 people) are hoping for them to appear in this year’s NHK Kohoku Uta Gassen. This was apparently what Shingo and Kusanagi Tsuyoshi said to Kousugi Ryuzo, the agency’s consultant/advisor, in their face-to-face meetings after the disbandment saga early this year. What happened 15 years ago, was Kimura’s flash marriage to Kudo Shizuka. His marriage was disapproved by Iljima, a mother-like manager of SMAP for many years. Details will be published in 17th August 2016 issue of Bunshun. 2 talks in early June 2016 took place with all 5 gathered. The agenda was an upcoming music show appearance in July. According to a TV personnel, Johnny Kitagawa(84) went as far as to persuade them with “After all, i’m already at this age.” He also tried to convince them to do a 25th anniversary concert citing fan expectations. That did not cause Katori Shingo(39) and others to change their minds. They did not want to do the 25th anniversary concert nor Kouhaku Uta Gassen nor continue with SMAP x SMAP. 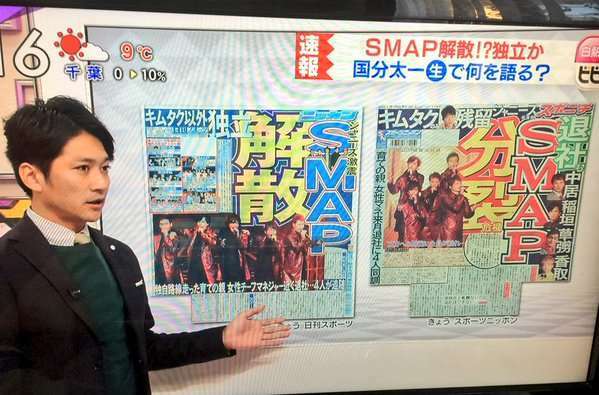 The conclusion – they did not wish to continue with SMAP. Katori Shingo was in a deep feud with Kimura Takuya(43), over the resignation of their ex-manager Iljima who took responsibilty after the SMAP disbandment saga early this year. A related personnel said “there is a deep sense of loss, and he’s lost his passion for everything”. If it were previous years, going on hiatus wouldn’t be a problem. But SMAP is welcoming their 25th anniversary in September, so there was a pressing need to announce their upcoming activities. When asked if he wanted to disband or go on hiatus, Shingo and others were just “okay with either”. When Johnny Kitagawa proposed that they go on hiatus, the guys changed their minds and opted to disband. Exact words from SMAPxSMAP yesterday…. Kimura Takuya: We have worried a lot of people. Continuing this way, we would have faced disbandment. Today it’s more important than anything to face everyone, so we borrowed time to do this. Inagaki Goro: Sorry for causing the chaos. I will work hard so u can continue to look at us, pls take care of us. Shingo Katori: Sorry for causing the worries. I want to create smiles again with everyone from today, pls take care of us. Nakai Masahiro: We understand once again how much support we’re receiving from everyone. Really sorry. Pls take care of us. Kusanagi Tsuyoshi: We realized a lot of things through your words this time. Thank you. Because of Kimura, we are able to apologise to Johnny and stand together. I feel comforted being here as 5. Kimura Takuya: Lastly, from now no matter what happens, we just want to look forward, so everyone pls take care of us. While specific words about not disbanding wasn’t mentioned, media/fans are seeing it that way. Others are intrigued by the expressions on members’ faces and speculating on the threats imposed on them by Johnny’s – some even compared the agency to mafia. Some call it power harassment. This apology scene got close to Kouhaku ratings of 37.2% in the Kanto region. Prime Minister Shinzo Abe also expressed relief at the group’s continuity, saying it was great that fans’ wishes were answered. Sponichi reported about misunderstandings causing the 4 to leave. Apparently, Iijima acted on her own to appoint SMAP as NHK’s Kouhaku hosts last year, angering Mary, so she told her to get out with SMAP. Not knowing that their manager was the spark for getting them exiled, the 4 resolved in leaving by themselves. Mary saw them as revolts like Iijima so things escalated to this point. SMAP manager’s coup d’etat fails, will the 4 return to Johnny’s? I can’t keep up with these twists and turns! SMAP manager Iijima’s attempt to turn independent has failed. She has expressed intentions to retire from showbiz, so all eyes are now on whether the 4 SMAP members will return to Johnny’s. Iijima’s coup d’etat started in summer last year. However, bringing the agency’s talent to set up shop elsewhere is considered breaking the rules. “This is not something that can be forgiven,” says a showbiz related personnel. Her coup d’etat did not garner support from the entertainment circle and ended in failure. The first sign of her failure came from the 12 Jan shareholders meeting of “J dream inc.”, a subsidiary of Johnny’s & Associates which SMAP members are also shareholders of. On this day, Iijima is supposed to be relieved of her duties as director. However, due to the failure of her coup d’etat, she announced resignation. “There was no need to hold the meeting anymore so it was cancelled.” – related personnel. Now, the 4 members have lost their new “destination” and it will not be easy for Johnny’s to accept them back, as management needs to caution existing talents about “switching sides”. 15 Jan: Nakai is pretty much decided on leaving . He is seeking advice from close colleagues Tamori San and Downtown’s Matsumoto about surviving in the industry from hereon. He will focus on being a talent/hosting like he is known for. Kimura will focus on dramas/movies. 15 Jan: Nakai sent mail to seniors/juniors in Johnny’s, as well as close friends in the industry expressing regret over his actions. In his message, he said he does not want to quit SMAP, and would do anything to protect SMAP and return to the way things were. 15 Jan: In radio show today, Kimura asks listeners to believe in him. He will talk about it when the time comes. Other members did not talk about it despite appearing in media today. 16 Jan: Kimura met up with the 4 and Iijima on 13 Jan and they talked through the night. They decided to continue as SMAP until September when their contracts expire. The 4, while willing to return to Johnny’s, are unable to gain forgiveness from Mary. Kimura is having a hard time being their bridge. 16 Jan: 15 Jan-while on set for movie filming, Kimura called up Johnny and Mary Kitagawa, pleading with them to let SMAP do something for 25th anniversary, says he wants to do it together with them. 18 Jan: Mary Kitagawa seems to have softened up and acknowledged that the 4 wants to continue SMAP activities. Outlook is turning positive. Kimura will have a meeting today with management, seems like final decision will be made. 19 Jan: SMAP appears on their variety show and apologized to fans, promising to work hard from now on. No specific talk about not disbanding but reports/fans are taking it that way. It seems like the 4 have finally apologized to Johnny/Mary Kitagawa on the night of 17th Jan with Kimura’s help. Trivia: Fans express their disapproval of the breakup by buying up copies of “Sekai ni Hitotsu Dake no Hana” single- SMAP hit song. Aim to hit 3million in total sales. The single is ranked No.9 on Oricon Daily Chart as of 15th Jan. The song has hit No.1 on Amazon and Recochoku on 16th and 17th Jan.
Why is Kimura Takura the sole member staying with Johnny’s? Whilst the rest of SMAP are leaving because of gratitude towards longtime manager Iijima, who resigned from Johnny’s and is leaving next month,reports say Kimura Takuya is staying as he is indebted to Johnny’s too. Reports of Kimura Takuya planning to go solo in 1997 because of his low salary became a hot topic then. Therefore, everyone would think that he’d be the first to quit. Netizens are abuzz with talk of why KimuTaku is staying. Most are guessing that he is sticking to Johnny’s because of his family. With a wife and kids, he cannot afford to take a risk like the other SMAP members who are still single. Another ex-music producer from a major record label was also interviewed. In line with news reports, he says SMAP members are not standing against Johnny’s agency. KimuTaku probably made this decision as he had a wide network of friends whom he seeked advice from, so he understood how people would look at him if he left Johnny’s. On the other hand, Nakai had publicly confessed that he didn’t have friends, the same can be said of the rest. He explains that Nakai has 5 variety shows to his name and 3 advertisements. He is favored not only because he’s an idol, but also a MC. If it becomes hard to appoint him given his independence, the TV stations will be troubled. According to various insiders, this triggered Iijima to start looking for a backer in another agency, starting summer. After discussions with the SMAP members, the 4 decided to stick with Iijima since they’d gone through tough times together since debut. Till the end, Takuya Kimura was troubled as he was unable to do the same. His reason for staying was because of wife, singer Kudo Shizuka, whom he married in 2000. Their marriage would have been sensationally reported if not for the intervention of Kitagawa Mary. Therefore she cannot betray Mary. She also wants Kimura to think of their daughters, aged 14 and 12. Mid December – Kimura decided to stay. Now, Kimura is trying to “repair” the relationship between Johnny’s agency and other 4. According to a related personnel, the 4 had intentions to stay early this year, with encouragement from Iijima. Through the attorney, Kitagawa Mary had also appealed for them to stay, but they did not listen. Kimura is mediating between the 4 and Mary so they can return. “If Iijima retires, SMAP may remain in the agency,”says a related personnel. Moving forward, if SMAP disbands, it’ll be difficult to use their name on TV shows, so starting April, SMAP may disappear from TV. However, since their contract runs until September, it’ll only be October before they can officially leave. Update: Iijima’s plans to go independent fails. 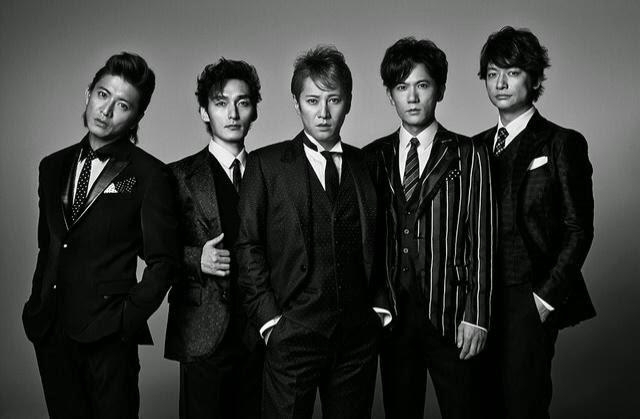 Breaking: 4 SMAP members leave Johnny’s, disbandment next? SMAP faces disbandment after their manager Iijima resigned from Johnny’s Entertainment. She will leave next month. With this move, 4 members(Nakai Masahiro, Inagaki Goro, Kusanagi Tsuyoshi, and Shingo Katori) also indicated their intentions to leave, with Kimura Takuya being the only one staying. A disbandment seems unavoidable. When contacted by Sponichi, Johnny’s lawyer said that the reports of Iijima resigning are generally correct. The group is supposed to welcome their 25th anniversary this year. Other than TOKIO’s Kokubun Taichi saying that he knows nothing and is simply shocked, i have no further updates. Follow my twitter for faster updates. Update: Why is Kimura Takuya the sole member remaining in Johnny’s? Update: Iijima’s coup d’etat fails, will the 4 members return to Johnny’s?